Why listen to talking heads babble about bombing Iran when you can bomb it yourself? Or at least you can by playing a board game, as I did when I playedPersian Incursion, in which you play out a hypothetical Israeli air offensive to destroy Iran’s nuclear weapons program. With the International Atomic Energy Agency claiming that Iran has continued its atomic weapons research, and Israel practically putting up billboards that say “we’re gonna bomb them before they bomb us,” this game may become reality. For a description of how Persian Incursion works, see my piece at ForeignPolicy.com. And let me add a couple of caveats. 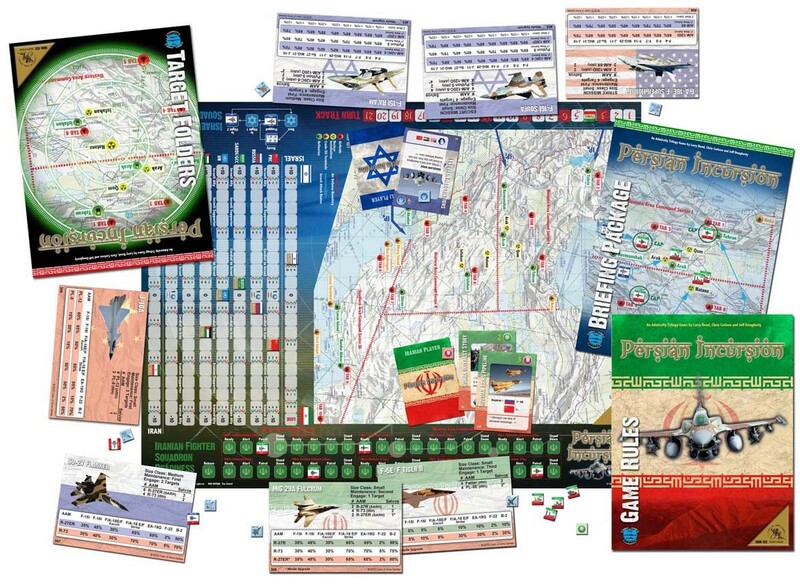 First, yes, someone actually designed a board game on Israel bombing Iran. Second, a wargame on a war that hasn’t yet happened will be riddled with assumptions that may or may not be right. But the co-designer of Persian Incursion is technothriller writer Larry Bond, who has co-authored books with Tom Clancy (Clancy apparently used one of Bond’s naval wargames to write The Hunt for Red October). Whether you like technothrillers or not, Bond is no slouch when it comes to projecting the shape of modern warfare, and he did a stunning amount of research for Persian Incursion. 1. Bombing Iran is complicated. There’s a lot of prep work that needs to done. Persian Incursion assumes that an Israeli air campaign is only feasible if one of Iran’s neighbors — Saudi Arabia, Turkey or Iraq — overtly or covertly agrees to Israeli passage through its airspace. 2. Iran can’t do jack about being bombed. The Persians in Persian Incursion have a snowball’s chance in hell of militarily stopping the Israeli onslaught. The Iranian player has to roll dice every turn just to see if his maintenance-starved air force can even get off the ground, while Israeli jammers and decoys keep things hopping for Iranian radars and anti-aircraft missiles. But Iran doesn’t have to shoot down every plane to win. Parading a dozen captured Israeli pilots before the cameras would be a political victory. 3. Israel can’t do jack about Iranian retaliation. The Israeli Air Force is going to be too busy bombing nuclear sites to go after Iranian missiles. The game assumes that Israel’s Arrow anti-missiles will knock down some Iranian rockets (I’m not so sure, given the less-than-sterling record of ballistic missile defense). But regardless, some Iranian weapons will get through. Israel has military superiority, but not invulnerability. 4. Iran’s nuclear hydra has many heads.Persian Incursion’s target folder lists dozens of Iranian nuclear facilities (along with their exact dimensions and defenses — the game is a reference library in a box). Some of them are hardened against all but the biggest bunker-busters. I don’t know how many would have to be destroyed to ruin Iran’s nuclear program, but the Israelis will have spread their limited resources over many targets. 5. Israel can’t do it all in one shot. Unlike the 1981 raid on Iraq’s Osirak reactor, Israel can’t pull this off in a single raid. Persian Incursion assumes Israel will need to conduct a one-week air campaign. Besides the diplomatic ramifications of a sustained assault, combat losses and maintenance downtime means the Israeli effort will only weaken over time. 6. Planning an air offensive is hard work. I have a lot of respect for U.S. Air Force planners after seeing what the Israeli player has to go through in Persian Incursion. Juggling the right mix of ordnance versus fuel tanks, and then calculating the right mix of bunker-busters versus air-to-air and anti-radar defensive missiles, is a brain teaser.